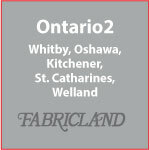 Fabricland Distributors Inc. started in August of 1968, when it opened its first store at Queen and Roncesvalles, in Toronto. It was a small store and carried the most popular fabrics of the day, mainly crimplene knits, at discount prices and a selection that could not be matched anywhere in Toronto. From this one small store, Fabricland expanded into the warehouse concept and image, carrying a much larger selection of fabrics and expanding into sewing notions and accessories to make it easier for customers to purchase all their sewing needs in one store. 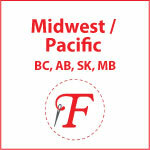 In the past 50 years Fabricland has grown into Canada's Largest Fashion Fabric Distributor, with over 100 stores across Canada. Today Fabricland carries the basics, including broadcloth, flannelette, arctic fleece, cottons and blends, as well as coordinated fashion collections that make putting together a wardrobe sew easy; trims, sewing notions, patterns and accessories, and for the home, a huge selection of drapery and upholstery fabrics. In 1993 Fabricland introduced an exclusive drapery department in many stores, known as the Home Dec Centre. The Home Dec Centre is virtually a store within a store, featuring an enhanced selection of drapery, upholstery, trims, notions, hardware and accessories presented in an inspiring environment with numerous displays, and overseen by trained professionals in the Home Dec field. Years ago, in response to the growing interest in the area of crafts and quilting, Fabricland more than doubled their selection in this area, bringing in an excellent selection of craft and quilting fabrics, specialty notions and accessories. Embracing the general trend towards easy and affordable no-sew decorating options, and recognizing the fact that today’s population has less and less time for dedicated sewing projects, Fabricland introduced their collection of ready-to-hang drapery panels, with over 350 styles in stock, always changing and on trend. A huge selection of drapery hardware, bedding and bedding accessories, shower curtain essentials, as well as a large seasonal selection of decorative home accessories … all of excellent quality and value, complete the no-sew options available. Many Fabricland locations offer sewing classes; décor and other special interest workshops are offered periodically at select locations. Please visit our Classes link for full details on where classes are offered. Our Sewciety Sewing Club has continued to grow and evolve with better benefits and bigger savings every day. Today, Sewing Club Members save 20-50% off our regular prices every day, on all most everything, at participating Ontario Region 1 stores. Fabricland continues to recognize and adapt to the needs and interests of its customers as it grows into the 21st century, with a well developed website and ever growing social media presence on Facebook, Instagram, Pinterest and Twitter. Come sew with us!